When a child experiences trauma regularly, the brain’s arousal system becomes constantly elevated because they have no sense about what to expect next. In this state, they struggle to find ways to feel calm, to feel safe, or how to feel in control. Toxic stress weakens the architecture of the developing brain, which can lead to lifelong problems in learning, behavior, and physical and mental health. Our brains and bodies are developed to help us respond to threat. We refer to this as flight, fight or freeze response. 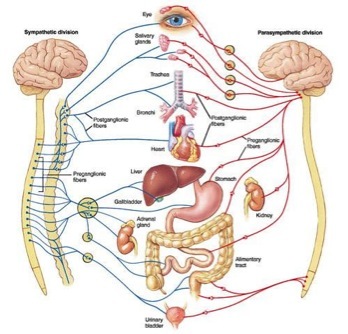 The Autonomic Nervous System (ANS) has a lot to do with these responses as the control system that largely acts unconsciously to regulate things such as heart rates, digestion and respiratory rate. The ANS is a network of nerve fibres that extend throughout the body connecting the brain with various organs and muscles groups. This system is mediated by two different branches that work in harmony to deal with the threats we face and then recover. Firstly, the sympathetic branch activates the physiological changes that rev us up to fight or flee. All this helps you fight harder, run faster, see better and breathe easier than you would without this response. Secondly, the parasympathetic branch activates changes needed to calm us down to rest and digest, helping return the body to homeostasis. This system can also be switched on if the stress continues without resolution. It supports the brain to relax a little and bring online more complex problem-solving resources to try and develop, consider and implement solutions to reduce the impact of the stress. One of these options is to seek out relationships that can help soothe stress, however for this to help the relationships need to be positive and nurturing. In these cases a person can become immobilised, meaning they can collapse or fall into submission, have an increased pain threshold, feign death or mentally remove themselves from their bodies. They also may have no explicit memory of it afterwards. What happens in the case of complex, ongoing trauma? This system is designed to be activated for short periods of time, not hours or days or even weeks on end as often occurs for children and young people who experience ongoing threats and stress. Trauma and chronic stress recalibrate the arousal system of children and young people, leaving it switched on all the time. Therefore, these young people will often, at baseline, be in a state of low level fear. These young people have learnt that ‘calm’ is not a valuable state of being, they are constantly ‘aroused’ and will be hyper-vigilant. Being at this higher starting point every day means that events we see as mildly or moderately stressful become fear-inducing for these young people. Even small changes in the environment can signal a large increase in the experience of stress. They rely on parents and caring adults around them to help them to calm their stress response systems and support them to remove the threat of reduce its impact. However, often it is these very relationships that create the unending cycle of toxic physiological and emotional stress that they are forced to endure, as such, abused children and young people are often left on their own to survive. Over time, this state has significant impacts on critical brain structures, particularly as children and young people are developmentally more susceptible to disruption than mature adult brains. As a result their brain may be in a very different state than that of other young people around them – a calm young person will process information very differently from one who is in an alarmed state. The young person who is alarmed will be less efficient at processing and storing information. Sub-cortical and limbic areas will dominate the young person’s cognition and thus they will focus on facial expressions, hand gestures and perceive mood which may be threatening to them. A young person’s emotional, behavioural and cognitive functioning will reflect this often in a regressed state. Toxic stress weakens the architecture of the developing brain, which can lead to lifelong problems in learning, behavior, and physical and mental health. Experiencing stress is an important part of healthy development. Activation of the stress response produces a wide range of physiological reactions that prepare the body to deal with threat. However, when these responses remain activated at high levels for significant periods of time, without supportive relationships to help calm them, toxic stress results. This can impair the development of neural connections, especially in the areas of the brain dedicated to higher-order skills. It has been shown that the connections between structures of the brain are made less efficient, e.g. the bridge structure between the left and right hemispheres has been found to be smaller and act slower as a consequence of trauma. Predictability and a sense of safety can help traumatised young people from staying in a state of fear too long. With support they can attempt to re-regulate, regain self-efficacy, control and mastery over themselves and their various environments.